Home » Website Building » WordPress » How to Setup WordPress FTP Account in Bluehost? How to Setup WordPress FTP Account in Bluehost? FTP is a “File Transfer Protocol” which allows you to access a web server remotely from your local computer. All files of your site are stored in a web server offered by your hosting company. The unlimited capabilities of WordPress.org site depends on how easily you can able to access those files stored in a server. Whether it is adding simple code in your “wp-config.php” or downloading entire media files from your server, FTP allows you to do it with ease. Once setup you can access and modify files without the need of logging into your Bluehost account remotely from your local computer. 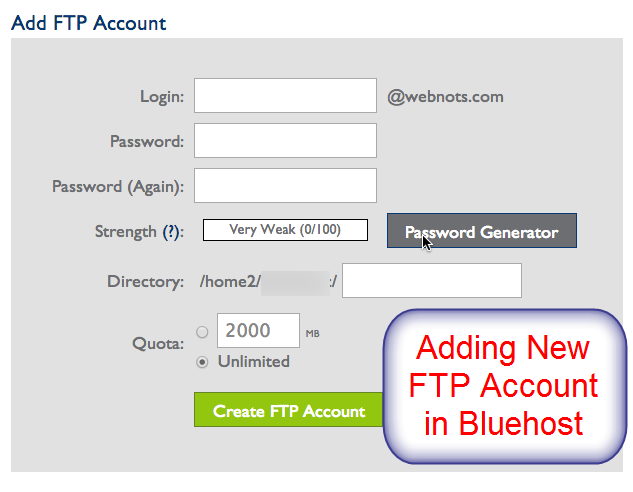 Follow the below steps to setup your FTP account in Bluehost. Login to your hosting account and navigate to “FTP” section available under “Hosting” tab. Enter the required details under “Add FTP Account” and click on “Create FTP Account” button. Login – This is your user name, by default it will be concatenated with your domain name. The final format of user name will be username@yourdomainname.com. Password – Enter a password. Password (Again) – Enter password again. Strength – Based on the complexity of your password the strength signal will increase. Ensure to have a very strong password and avoid using the same password of your Bluehost account here. Password Generator – click on the password generator button so that Bluehost will generate a complex password for you. Directory – This particular FTP account user will only have an authorization to access files available in the directory entered here. For example, if you installed WordPress on a subdirectory called “Blog”, here you can enter as “blog”. Normally WordPress is installed under the directory “public_html” hence enter “public_html”. Quota – It is used to provide a limited file upload usage quota for a particular FTP account user when you want to have more number of users. Generally choose “unlimited” option to provide a full quota access. New FTP account will be created which can be seen under “FTP Accounts” section when you scroll down the page. Click on the “Configure FTP Client” link to see your FTP user name, server and port details. Now that your FTP account is setup in Bluehost and ready for use. You will also see “Special FTP Accounts” available in your account by default. These special FTP accounts are auto generated for the purpose of logging and user access. In order to use FTP you need to install a software on your local PC or Mac. There are many FTP softwares available for free; FileZilla, Cyberduck and CoreFTP are some examples. Learn how to connect FileZilla to your Bluehost FTP server.